The Country Music Hall of Fame is a museum at 222 Fifth Avenue South in Nashville, Tennessee, United States. Its mission is to document the history of country music and to honor its major figures. In 1961, the Country Music Association (CMA) announced the creation of the Country Music Hall of Fame. The first three inductees, Jimmie Rodgers, Fred Rose and Hank Williams, were announced at a CMA banquet in November. Bronze plaques, with the facial likeness and a thumbnail biography of each new member, were cast in bas relief. They were unveiled on the Grand Ole Opry by Ernest Tubb. These plaques, and those for subsequent Hall of Fame inductees, were displayed in the Tennessee State Museum in Nashville until 1967. In 1963, the CMA announced that a Country Music Hall of Fame and Museum was to be built on Music Row in Nashville. In that same year, Tennessee chartered the Country Music Foundation (CMF) as a nonprofit, educational organization to operate the museum. The Ryman Auditorium is a live performance venue located at 116 Fifth Avenue North in Nashville, Tennessee, and is best-known as the one-time home of the Grand Ole Opry. The auditorium was first opened as the Union Gospel Tabernacle in 1892. It was built by Thomas Ryman (1843–1904), a riverboat captain and Nashville businessman. After his death, the Tabernacle was renamed Ryman Auditorium in his honor. It was used for Grand Ole Opry broadcasts from 1943 to 1974, when the Opry built a larger venue just outside Nashville. The Ryman then sat mostly vacant until 1994 when it was restored and reopened as a performance venue and museum. Many of the greats of country music have performed at the Ryman over the years, including Roy Acuff, Johnny Cash, Garth Brooks, Patsy Cline, Dixie Chicks, Tennessee Ernie Ford, Emmylou Harris, George Jones, Loretta Lynn, Reba McEntire, Dolly Parton, Marty Robbins, Ernest Tubb, Dottie West, Hank Williams, and Tammy Wynette. Besides country, the venue also features alternative, bluegrass, blues, classical, gospel, jazz, pop, and rock, as well as musical theatre. The Grand Ole Opry is a weekly Saturday night country music radio program broadcast live on WSM Radio in Nashville, Tennessee. It is the oldest continuous radio program in the United States, having been broadcast on WSM since November 28, 1925. 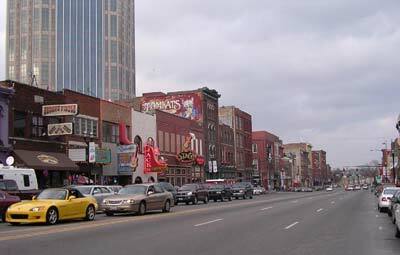 It is also televised and promotes live performances both in Nashville and on the road. The CMA Music Festival is steeped in more than three decades of tradition. Since the festival's birth as Fan Fair in 1972, Country Music fans have poured into Nashville, Tennessee, traveling from around the globe to see their favorite artists perform, to get that coveted autograph and to create lifelong memories. Centennial Park (Nashville) is a large urban park located approximately two miles (three km) west of downtown Nashville, Tennessee, across West End Avenue (U.S. Highway 70S) from the campus of Vanderbilt University and adjacent to the headquarters campus of the Hospital Corporation of America. It was the site of the Tennessee Centennial and International Exposition of 1897 and was named after this event. After the exposition ended, most of the building and exhibits (with the exception of a full-scale model of the Athenian Parthenon) were dismantled, leaving in its place a landscaped open area with a small artificial lake (named "Lake Watauga" after the region in western North Carolina where many of Nashville's early settlers moved from), sunken gardens, and a bandshell. This area became an important recreation site for white Nashvillians; "Jim Crow" laws forbade its use by blacks until the 1960s, which resulted in disagreements which led to the closure of the park's swimming pool and its subsequent reopening as an arts center. The Tennessee State Capitol, located in Nashville, Tennessee, is the home of the Tennessee legislature, and the location of the governor's office. It was designed by Philadelphia architect William Strickland, who modeled it after a Greek Ionic temple. The building was constructed over a period of ten years from 1845 to 1855. Strickland died a year before the building's completion and was entombed in its northeast wall. His son, F. W. Strickland, supervised completion of the structure. The Nashville Zoo at Grassmere is the newest zoo in the United States and is located six miles (10 km) southeast of downtown Nashville, Tennessee. The zoo was founded in 1996, the result of a merger between two upstart competing facilities, Nashville Zoo (located in nearby Ashland City) and Grassmere Wildlife Park (which was located at the zoo's present location). It has been engineered to grow to take maximum advantage of its 200 acres (800,000 m²). The zoo is home to many native and exotic animals including African Elephants, Bengal Tigers, North American River Otters, White-Handed Gibbons, and many others. The zoo is active in conservation activities including participating in a number of the programs in the The Species Survival Plan which is managed by the American Zoo and Aquarium Association. The Hermitage is a plantation located 12 miles east of downtown Nashville. The plantation was owned by Andrew Jackson, the seventh President of the United States from 1804 until his death at The Hermitage in 1845. Jackson only lived at the property occasionally until he retired from public life in 1837. The original Hermitage mansion, a brick building in the Federal style, was built between 1819 and 1821. The structure was remodeled in 1831 and a Palladian facade was added. In 1834, fire seriously damaged much of the building. The current structure was completed in 1836. The Hermitage is now a museum, both of Jackson's life and the antebellum South in general, and is open to the public. The tomb of Andrew and Rachel Jackson is located in the Hermitage garden. The area of Davidson County, Tennessee surrounding the Hermitage is known as Hermitage, Tennessee, an unincorporated community. Civil War history is also important to the city's tourism industry. Sites pertaining to the Battle of Nashville and the nearby Battle of Franklin and Battle of Stones River can be seen, along with several well-preserved antebellum plantation houses such as Belle Meade Plantation and Belmont Mansion. The Schermerhorn Symphony Center is a symphony hall in downtown Nashville, Tennessee. It is under construction and is scheduled to be opened with its first concert in September 2006. Ground was broken for construction of the hall on December 3, 2003. When completed the hall will have approximately 1,900 seats. The hall will be home to the Nashville Symphony. It is reportedly going to be one of the most state of the art facilities for hearing orchestral music. The hall is named in honor of Kenneth Schermerhorn who was the music director and conductor of the Nashville Symphony Orchestra from 1983 until his death in 2005. The Frist Center for the Visual Arts is an art museum in Nashville, Tennessee. A post office is a facility (in most countries, a government one) where the public can purchase postage stamps for mailing correspondence or merchandise, and also drop off or pick up packages or other special-delivery items. Fisk University is a historically black college in Nashville, Tennessee, USA. It was established by John Ogden, Reverend Erastus Milo Cravath and Reverend Edward P. Smith and named in honor of General Clinton B. Fisk of the Tennessee Freedmen's Bureau. Fisk opened to classes on January 9, 1866. Fisk heralded its first African American president with the arrival of Charles Spurgeon Johnson in 1947. Johnson was a premier sociologist, a scholar who had been the editor of Opportunity magazine, a noted periodical of the Harlem Renaissance. Fisk University is currently under the direction of its 14th president, the Honorable Hazel O'Leary, former Secretary of Energy under President William Jefferson Clinton. She is the second female president of the university.